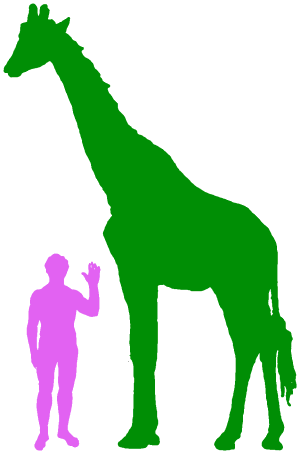 The Giraffe – The World’s Tallest Animal! The Giraffe is the world’s tallest living animal – a male giraffe grows up to 16-18 feet tall (4.9 – 5.5 metres). The tallest ever giraffe was 19.2 feet tall! Scientists call the giraffe Giraffa Camelopardus. The word “Giraffe” comes from the Arabic word for “tall”. In olden times the giraffe was called a “Camel-leopard”, since it had spots a bit like a leopard, but walked a bit like a camel. Because the giraffe is so tall, it has some other special features. First of all, to pump blood all the way up its long neck, the giraffe needs a very strong heart. In fact, its heart weighs 26 lb (12 kg), making it the biggest heart in the animal kingdom! Also, it has special blood vessels in its head to prevent it from fainting when it lifts its head suddenly! When a giraffe is kept in a zoo, it is sometimes the tallest thing in the whole zoo. This means it’s the most likely to be struck by lightning during a thunderstorm! In the wild, giraffes live amongst trees that are taller than they – and besides, the places they live have much less lightning than most other places in the world. 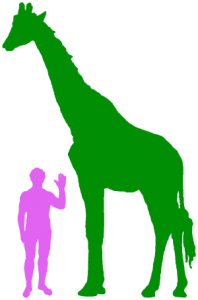 The picture below shows how big a giraffe is relative to a typical human. 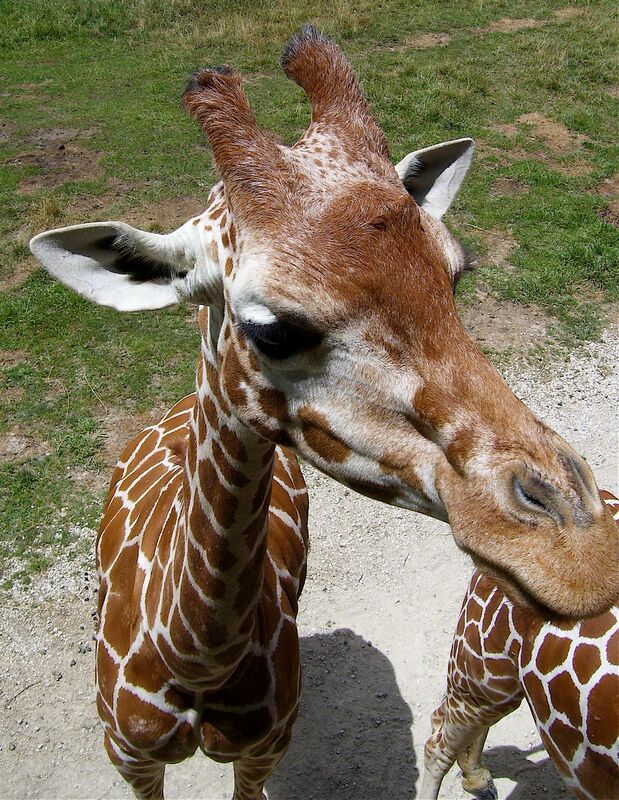 The Giraffe has a very long neck, but has the same number of neck bones as a human – seven. This is half the number of neck bones as a hummingbird! However, the joints between the bones are very flexible. Giraffes will sometimes rub their necks together. This can be a friendly gesture, or might be part of a fight. The Giraffe’s tongue is very remarkable – first of all, it is very long – about 18-20 inches (45-50cm). When its long legs and long neck are not quite long enough, it uses its long tongue to help it reach leaves growing high up. It also finds its tongue useful for chasing bugs off its face. The Giraffe likes all kinds of plants, but some of its favorites are very thorny. Because of this, its tongue is also very very tough, so that it doesn’t get hurt during lunch! The Giraffe’s horns are made of hardened cartilage – like the stuff that gives shape to our nose, but harder. The horns are covered in skin. A female giraffe’s horns are shorter than a male’s, and tend to have hair on top. Giraffes like open areas with scattered trees – especially acacia trees. They eat the leaves of trees, digest them for a while, then (like cows) vomit up the half digested leaves (the “cud”) so they can chew it some more and digest it again in a different part of their stomach. Because of this habit, Giraffes (with cows) are classified as “Ruminants”. 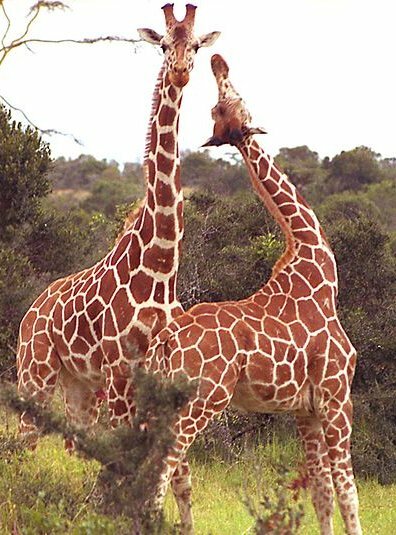 Giraffes can live in the same places as farm animals, since Giraffes prefer to eat leaves that farm animals can’t reach. However, if the farmers clear away all the trees from an area, the Giraffe is in trouble. Although Giraffes as a species are secure, in some parts of Africa, their numbers are going down. The Giraffe needs very little sleep – only about two hours a day, with very short naps in between. Although giraffes seem very quiet, they in fact make a whole lot of different sounds – coughs, grunts, bleats, whistles – and a lot more sounds that are too low for us to hear. Scientists put Giraffes in a family of mammals called Giraffidae. There are only two types of Giraffidae alive today, the Giraffe itself, and the Okapi (a beautiful-looking animal, and the only mammal that can lick its own ears). Giraffidae in turn are Ruminants, which in turn are in the “order” called Artiodactyla, or “even-toed ungulates“. The world’s tallest of the 5400 types of mammal, as well as being the world’s tallest living animal. When a Giraffe wants to run, it can run very fast. Thanks to its long legs, it can reach speeds of 35 mph (55 km/h). Most four-legged animals, when they run, will move their front right and back left legs forward together, and then their front left and back right legs. If the Giraffe tried this, it might trip over! So instead, it moves both its left legs forward, then both its right legs – taking steps up to 15 feet (5 metres) long. Thank you! Giraffes are my favorite animal and I learned alot more!